Like the “Synergy” feature of Palm’s WebOS, social networking – Facebook, Twitter etc. – is integrated at the heart of the phone in a people not service-centric way. View a contact on the phone’s address book and you’re presented not only with their contact details and latest text messages but also status updates from Facebook and their most recently published photos on various photo sharing sites. And like Gmail, the Hero’s email client presents emails as threaded conversations. Another example of deeper web-service integration is the phone’s photo gallery app that not only accesses pictures taken by and stored locally on the device but can also pull in images from third-party photo sharing sites. Search also borrows a little from the iPhone’s and Palm Pre’s “Universal” approach, not only searching data on the phone itself but also Twitter and, presumably, Google or one of its competitors. Predictably, home screen widgets also feature heavily. And once again, these can pull in local data – latest SMS messages, world clock etc. – or that from third-party web services, such as the latest status updates, weather etc. The best comparison in this area is Nokia’s newly released N97. 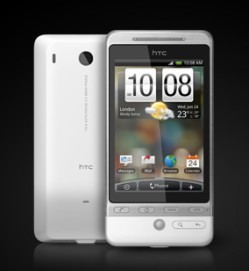 All in all, it not only looks like HTC have put their own stylistic stamp on the standard Android UI but that HTC Sense, debuting on the Hero, takes and builds on top of the best of recent innovations from Apple, Palm and Nokia. How well this works in everyday use, we don’t yet know. With the Hero set to go on sale in Europe sometime next month, hopefully I’ll get my hands on a review unit soon.